Today, we continued developing the electric pressure model. 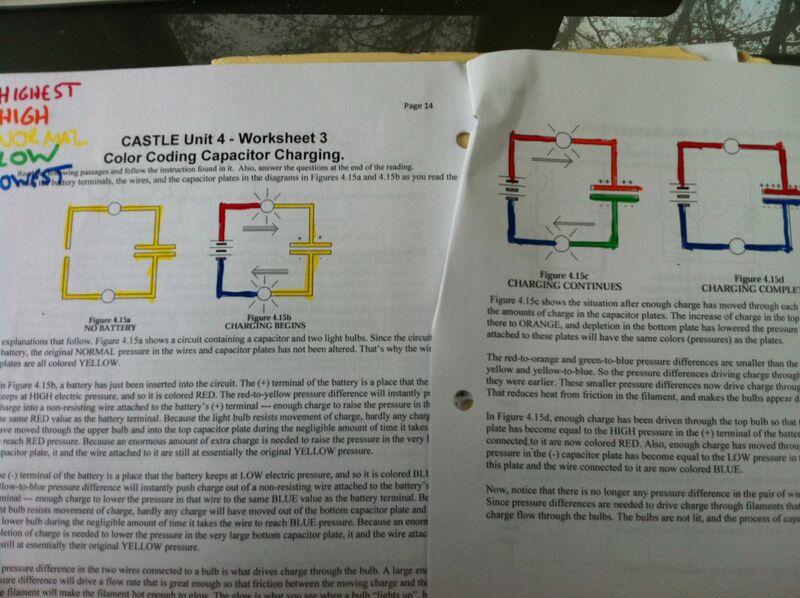 I introduced the CASTLE representation for electric pressure where the relative pressure is denoted by different colored wires in the circuit diagram. The contrast of colors reinforces that there must be an electric pressure difference in order for current to flow and bulbs to glow. In addition, if the current is constant, elements with greater resistance require a greater difference in electric pressure than elements with less resistance. This year, my colleague carefully chose the diagrams such that five colors of electric pressure (highest, high, normal, low, lowest) would suffice, which avoids having to color wires orangish-red. This diagrammatic technique is a powerful way for students to visualize voltage. For homework tonight, they will revisit the pizza problem and solve it using our new electric pressure model.